Et Verbum: The Life Of Fr John Gerard S.J. (A Hunted Priest) Part 28. Escape From The Tower. The Life Of Fr John Gerard S.J. (A Hunted Priest) Part 28. Escape From The Tower.
" I THUS endeavoured to conform myself to the decrees of God and the tyranny of man; when lo! on the last day of July , the anniversary of our holy Father Ignatius' departure from this life, while I was in meditation, and was entertaining a vehement desire of an opportunity for saying Mass, it came into my head that this really might be accomplished in the cell of a certain Catholic gentleman [John Arden], which lay opposite mine on the other side of a small garden within the Tower. This gentleman 1 had been detained ten years in prison. He had been indeed condemned to death, but the sentence was not carried out. He was in the habit of going up daily on the leads of the building in which he was confined, which he was allowed to use as a place of exercise; here he would salute me, and wait for my blessing on bended knees. "On examining this idea of mine more at leisure, I concluded that the matter was feasible, if I could prevail on my gaoler to allow me to visit this gentleman. For he had a wife who had obtained permission to visit him at fixed times, and bring him changes of linen and other little comforts in a basket; and as this had now gone on many years, the officers had come to be not so particular in examining the basket as they were at first. I hoped therefore that there would be a possibility of introducing gradually by means of this lady all things necessary for the celebration of Mass, which my friends would supply. Resolving to make the trial, I made a sign to the gentleman to attend to what I was going to indicate to him. I then took pen and paper and made as if I was writing somewhat; then, after holding the paper to the fire, I made a show of reading it, and lastly I wrapped up one of my crosses in it, and made a sign of sending it over to him. I dare not speak to him across the garden, as what I said would easily have been heard by others. Then I began treating with my gaoler to convey a cross or a rosary for me to my fellow-prisoner, for the same man had charge of both of us, as we were near neighbours. At first he refused, saying that he durst not venture, as he had had no proof of the other prisoner's fidelity in keeping a secret. 'For if,' said he, 'the gentleman's wife were to talk of this, and it should become known I had done such a thing, it would be all over witji me.' I reassured him, however, and convinced him that such a result was not likely, and, as I added a little bribe, I prevailed upon him as usual to gratify me. He took my letter, and the other received what I sent; but he wrote me nothing back as I had requested him to do. Next morning, when he made his appearance on the leads, he thanked me by signs, and showed the cross I had sent him.
" After three days, as I got no answer from him, I began to suspect the real reason, viz., that he had not read my letter. So I called his attention again, and went through the whole process in greater detail. Thus, I took an orange and squeezed the juice into a little cup,, then I took a pen and wrote with the orange-juice, and holding the paper some time before the fire, that the writing might be visible, I perused it before him, trying to make him understand that this was what he should do with my next paper. This time he fathomed my meaning, and thus read the next letter I sent him. He soon sent me a reply, saying that he thought the first time I wanted him to burn the paper, as I had written a few visible words on it with pencil ; therefore he had done so. To my proposal moreover he answered, that the thing could be done, if my gaoler would allow me to visit him in the evening and remain with him the next day; and that his wife would bring all the furniture that should be given her for the purpose. "As a next step I sounded the gaoler about allowing me to visit my fellow-prisoner, and proposed he should let me go just once and dine with him, and that he the gaoler, should have his share in the feast. He refused absolutely, and showed great fear of the possibility of my being seen as I crossed the garden, or lest the Lieutenant might take it into his head to pay me a visit that very day. But as he was never in the habit of visiting me, I argued that it was very improbable that the thing should happen as he feared; after this, the golden arguments I adduced proved completely successful, and he acceded to my request. So I fixed on the Nativity of the Blessed Virgin ; and in the meanwhile I told my neighbour to let his wife call at such a place in London, having previously sent word to John Lilly what he should give her to bring. I told him, moreover, to send a pyx and a number of small hosts, that I might be able to reserve the Blessed Sacrament. He provided all I told him, and the good lady got them safely to her husband's cell. So on the appointed day I went over with my gaoler, and stayed with my fellow-prisoner that night and the next day; but the gaoler exacted a promise that not a word of this should be said to the gentleman's wife. The next morning, then, I said Mass, to my great consolation ; and that Confessor of Christ communicated, after having been so many years deprived of that favour. In this Mass I consecrated also two and twenty particles, which I reserved in the pyx with a corporal; these I took back with me to my cell, and for some days renewed the Divine banquet with ever-fresh delight and consolation. "Now while we were together that day, I—though nothing was less in my thoughts when I came over than any idea of escape (for I sought only our true deliverer Jesus Christ, as He was prefigured in the little ash-baked loaf of Elias, that I might with more strength and courage travel the rest of my way even to the mount of God)— seeing how close this part of the Tower was to the moat by which it was surrounded, began to think with myself that it were a possible thing for a man to descend by a rope from the top of the building to the other side of the moat. I asked my companion therefore what he thought about it, and whether it seemed possible to him.
" I returned that night to my cell, and wrote a letter to Father Garnet by John Lilly, putting all the circumstances before him. He answered me that the thing should be attempted by all means, if I thought it could be done without danger to my life in the descent.
" Upon this I wrote to my former host [Mr. Wiseman], telling him that an escape in this way could be managed, but that the matter must be communicated to as few as possible, lest it should* get noised about and stopped. I appointed moreover John Lilly and Richard Fulwood, the latter of whom was at that time serving Father Garnet, if they were willing to expose themselves to the peril, to come on such a night to the outer bank of the moat opposite the little tower in which my friend was kept, and near the place where Master Page was apprehended, as I described before. They were to bring with them a rope, one end of which they were to tie to a stake, then we from the leads on the top of the tower would throw over to them a ball of lead with a stout string attached, such as men use for sewing up bales of goods. This they would find in the dark by the noise it would make in falling, and would attach the string to the free end of their rope, so that we who retained one end of the string would thus be able to pull the rope up. I ordered, moreover, that they should have on their breasts a white paper or handkerchief, that we might recognize them as friends before throwing our string, and that they should come provided with a boat in which we might quickly make our escape. "When these arrangements had been made and a night fixed, yet my host wished that a less hazardous attempt should first be made, namely, by trying whether my gaoler could be bribed to let me out, which he could easily do by permitting a disguise. John Lilly, therefore offered him on the part of a friend of mine a thousand florins [100/.] on the spot, and a hundred florins [10/.] yearly for his life, if he would agree to favour my escape. The man would not listen to anything of the kind, saying he should have to live an outcast if he did so, and should be sure to be hanged if ever he was caught. Nothing therefore could be done with him in this line. So we went on with our preparations according to our previous plan ; and the matter was commended to God with many prayers by all those to whom the secret was committed. One gentleman indeed, heir to a large estate, made a vow to fast once a week during his life if I escaped safely. When the appointed night came, I prevailed on the gaoler by entreaties and bribes to allow me to visit my friend. So he locked us both in together with bolts and bars of iron as usual, and departed. But as he had also locked the inside door that led to the roof, we had to loosen the stone, into which the bolt shot, with our knives, or otherwise we could not get out. This we succeeded in doing at length, and mounted the leads softly and without a light, for a sentinel was placed in the garden every night, so that we durst not even speak to each other but in a very low whisper. "About midnight we saw the boat coming with our friends, namely, John Lilly, Richard Fulwood, and another who had been my gaoler in the former prison, through whom they procured the boat, and who steered the boat himself. They neared the shore ; but just as they were about to land, some one came out of one of the poor cottages thereabouts to do somewhat, and seeing their boat making for the shore, hailed them, taking them for fishermen. The man indeed returned to his bed without suspecting anything, but our boatmen durst not venture to land till they thought the man had gone to sleep again. They paddled about so long however that the time slipped away, and it became impossible to accomplish anything that night; so they returned by London Bridge. But the tide was now flowing so strongly that their boat was forced against some piles there fixed to break the force of the water, so that they could neither get on nor get back. Meanwhile the tide was still rising, and now came so violently on the boat that it seemed as if it would be upset at every wave. Being in these straits they commended themselves to God by prayers, and called for help from men by their cries.
" All this while we on the top of the tower heard them shouting, and saw men coming out on the bank of the river with candles, running up and getting into their boats to rescue those in danger. Many boats approached them but none durst go up to them, fearing the force of the current. 2 So they stood there in a sort of circle round them, spectators of their peril, but not daring to assist. I recognized Richard Fulwood's voice in the shouts, and said, 'I know it is our friends who are in danger.' My companion indeed did not believe I could distinguish any one's voice at that great distance; 3 but I knew it well, and groaned inwardly to think that such devoted men were in peril of their lives for my sake. We prayed fervently therefore for them, for we saw that they were not yet saved, though many had gone to assist them. Then we saw a light let down from the bridge, 4 and a sort of basket attached to a rope, by which they might be drawn up, if they could reach it. This it seems they were not able to do. But God had regard to the peril of his servants, and at last there came a strong sea boat with six sailors, who worked bravely, and bringing their boat up to the one in danger took out Lilly and Fulwood. Immediately they had got out, the boat they had left capsized before the third could be rescued, as if it had only kept right for the sake of the two who were Catholics. However by God's mercy the one who was thrown into the river caught a rope that was let down from the bridge, and was so dragged up and saved. So they were all rescued, and got back to their homes.
" My companion on seeing such constancy joined with such strong and at the same time pious affection, was greatly consoled and did not doubt success. But I had great ado to obtain leave from the gaoler to remain another night out of my cell; and had misgivings that he would discover the loosening of the stone when he locked the door again. He however remarked nothing of it.
" In the meantime I had written three letters to be. left behind. One was to the gaoler, justifying myself for taking this step without a word to him; I told him I was but exercising my right, since I was detained in prison without any crime, and added that I would always remember him in my prayers, if I could not help him in any other way. I wrote this letter with the hope that if the man were taken into custody for my escape it might help to show that he was not to blame. The second letter was to the Lieutenant, in which I still further exonerated the gaoler, protesting before God that he knew nothing whatever about my escape, which was of course perfectly true, and that he certainly would not have allowed it if he had suspected anything. This I confirmed by relating the very tempting offer which had been made him and which he had refused. As to his having allowed me to go to another prisoner's cell, I said I had extorted it from him with the greatest difficulty by repeated importunities, and therefore it would not be right that he should suffer death for it. The third letter was to the Lords of the Council, in which I stated first the causes which moved me to the recovery of my liberty of which I had been unjustly deprived. It was not so much the mere love of freedom, I said, as the love of souls which were daily perishing in England that led me to attempt the escape, in order that I might assist in bringing them back from sin and heresy. As for matters of State, as they had hitherto found me averse to meddling with them, so they might be sure that I should continue the same. Besides this, I exonerated the Lieutenant and gaoler from all consent to or connivance at my escape, assuring them that I had recovered my liberty entirely by my own and my friends' exertions. I prepared another letter also, which would be taken next morning to my gaoler, not however by John Lilly, but by another, as I shall narrate presently. "At the proper hour we mounted again on the leads. The boat arrived and put to shore without any interruption. The schismatic, my former gaoler, remained with the boat, and the two Catholics came with the rope. It was a new rope, for they had lost the former one in the river on occasion of their disaster. They fastened the rope to a stake, as I had told them ; they found the leaden ball which we threw, and tied the string to the rope. We had great difficulty however in pulling up the rope, for it was of considerable thickness, and double too. In fact Father Garnet ordered this arrangement, fearing lest otherwise the rope might break by the weight of my body. But now another element of danger showed itself, which we had not reckoned on: for the distance was so great between the tower and the stake to which the rope was attached, that it seemed to stretch horizontally rather than slopingly ; so that we could not get along it merely by our weight, but would have to propel ourselves by some exertion of our own. We proved this first by a bundle which we had made of books and some other things wrapped up in my cloak. This bundle we placed on the double rope to see if it would slide down of itself, but it stuck at once. And it was well it did; for if it had gone out of our reach before it stuck, we should never have got down ourselves. So we took the bundle back and left it behind.
" My companion, who had before spoken of the descent as a thing of the greatest ease, now changed his mind, and confessed it to be a thing very difficult and full of danger. ' However,' said he, ' I shall most certainly be hanged if I remain now, for we cannot throw the rope back without its falling into the water, and so betraying both us and our friends. I will therefore descend, please God, preferring to expose myself to danger with the hope of freedom, rather than to remain here with good certainty of being hanged.' So he said a prayer, and took to the rope. He descended fairly enough, for he was strong and vigorous, and the rope was then taut; his weight however slackened it considerably, which made the danger for me greater, and though I did not then notice this, yet I found it out afterwards when I came to make the trial.
" So commending myself to God, to our Lord Jesus, to the Blessed Virgin, to my Guardian Angel, and all my patrons, particularly Father Southwell, who had been imprisoned near this place for nearly three years before his martyrdom, and Father Walpole, I took the rope in my right hand and held it also with my left arm; then I twisted my legs about it, to prevent falling, in such a way that the rope passed between my shins. I descended some three or four yards face downwards, when suddenly my body swung round by its own weight and hung under the rope. The shock was so great that I nearly lost my hold, for I was still but weak, especially in the hands and arms. In fact, with the rope so slack and my body hanging beneath it, I could hardly get on at all. At length I made a shift to get on as far as the middle of the rope, and there I stuck, my breath and my strength failing me, neither of which were very copious to begin with. After a little time, the saints assisting me, and my good friends below drawing me to them by their prayers, I got on a little further and stuck again, thinking I should never be able to accomplish it. Yet I was loth to drop into the water as long as I could possibly hold on. After another rest therefore I summoned what remained of my strength, and helping myself with legs and arms as well as I could, I got as far as the wall on the other side of the moat. But my feet only touched the top of the wall, and my whole body hung horizontally, my head being no higher than my feet, so slack was the rope. In such a position, and exhausted as I was, it was hopeless to expect to get over the wall by my own unaided strength. So John Lilly got on to the wall somehow or other (for, as he afterwards asserted, he never knew how he got there), took hold of my feet, and by them pulled me to him, and got me over the wall on to the ground. But I was quite unable to stand, so they gave me some cordial waters and restoratives which they had brought on purpose. By the help of these I managed to walk to the boat, into which we all entered. They had, however, before leaving the wall, untied the rope from the stake and cut off a part of it, so that it hung down the wall of the Tower. We had previously, indeed, determined to pull it away altogether, and had with this object passed it round a great gun on the Tower without knotting it. But God so willed it that we were not able by any exertion to get it away; and if we had succeeded it would certainly have made a loud splash in the water, and perhaps have brought us into a worse danger. On entering the boat we gave hearty thanks to God Who had delivered us from the hand of the persecutor, and from all the expectation of the people; [Acts xii. II.] and we also returned our best thanks to those who had exposed themselves to such labours and perils for our sakes." Father Gerard has now told the story of his torture in the Tower and of his escape from that famous State prison. However eager we might be to identify the places mentioned by him, it was impossible that we should permit ourselves to check the interest of the story by breaking its thread. Now that the tale is told we may pause to visit the Tower of London [This examination of the localities in the Tower of London was published in the Month for December, 1874.] to ascertain which was the cell occupied by Father Gerard and which was the point where he succeeded in crossing the moat. He has mentioned a sufficient number of circumstances to make this identification possible, and as far at least as the cells are concerned which were honoured by the imprisonment of Father Henry Walpole and himself, they are happily in excellent condition, and but little changed. 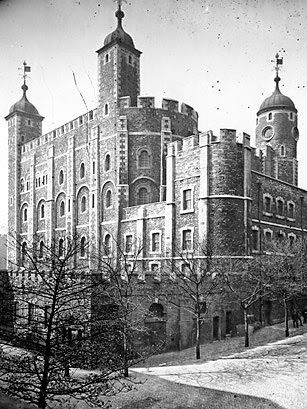 He has told us that, when brought to the Tower, he was conducted by Sir Henry Barkeley, the Lieutenant, " to a large high tower of three storeys, with a separate lock-up place in each, one of a number of different towers contained within the whole inclosure. He left me," said Father Gerard, " in the lowest part," and the warder, after throwing some straw on the ground, "fastened the door of my prison and secured the upper door both with a great bolt and iron bars. The next day I examined the place, for there was some light though dim, and I found the name of Father Henry Walpole, of blessed memory, cut with a knife on the wall, and not far from there I found his oratory, which was a space where there had been a narrow window, now blocked up with stones. There he had written on either side with chalk the names of the different choirs of angels, and on the top, above the cherubim and seraphim, the name of the Mother of God, and above that again, in Latin, Greek, and Hebrew, the name of God." The place thus described was the Salt Tower, an ancient tower, the origin of the name of which is unknown, and which seems at one time to have shared with the White Tower the honour of being called after " Julyus Sesar." [Survey of 1532, quoted in Bayly's History of the Tower.] The tower has received a new external face of stone, but the interior is as nearly in its ancient state as is compatible with its present use as a dwelling-house. A door has been opened at the bottom of the tower, which did not exist in Father Gerard's time, when the entrance to it was from the ballium wall or inner line of fortification, of which the Salt Tower formed the south-east angle. Father Gerard took no account of what is now called the cellar, and the interior face of the stones of its walls shows no sign of ever having been scored by a prisoner's knife. Besides this there are three ancient storeys. What we should now call the first floor is the cell to which Father Gerard descended from the door by which he entered the tower, and which he calls "the lower dungeon" where Father Walpole's "oratory" was. The room is "sufficiently large and commodious for a prisoner," being internally a pentagon about sixteen feet across. It is no longer dimly lighted, for a modern two-light ^othic window has taken the place of one of the ancient loopholes, through which the cell received of old such light and air as it had. There were five of these narrow openings in the enormously thick walls of the circular tower, and as Father Gerard says that one at least of these was blocked up with stones, the place may well have been dim. There are many inscriptions remaining on the walls of the cell, interesting enough in their way; but there is one in particular, that has not been noticed in any of the books written on the Tower, the sight of which is enough to make one's heart leap into one's mouth. These are the words, thickly coated with whitewash, that testified that in this cell Father Walpole had been imprisoned. The name of the martyr is to be seen where Father Gerard saw it, by the window, though of course the holy words that he had written close by in chalk have long ago been effaced. A very fine old fireplace faces you as you enter the cell, and the window once thus sanctified is the next to it on your left. " It was truly a great consolation to me," says Father Gerard, and his words find their echo still, "to find myself in this place, hallowed by the presence of so great and so devoted a martyr, the place too in which he was frequently tortured, to the number, as I have heard, of fourteen times. Probably they were unwilling to torture him in public and in the ordinary place, because they did it oftener than they would have it known." There are other thoughts that mingle in our minds with those expressed by Father Gerard, for he did not know that which to our grief the State Papers make known to us, that the cruel, oft-repeated torture did its wicked work, and wrenched from the broken spirit what the conscience condemned. But though they extorted what was wrong, the torturers evidently did not get all that they wanted, so that that which they got was valueless in their eyes. So they sent him to York to be tried for the crime of his priesthood, and the guilt of the words extorted by torture was washed away in the baptism of blood. Father Gerard's prison was the cell overhead. It must be visited in order to ascertain which was the tower where Father Gerard said mass and from the top of which he afterwards escaped. It "lay opposite to mine," he says, "on the other side of a small garden within the Tower." So far the description is verified by either of two small towers in the outer line of fortification. The Salt Tower, the Well Tower, and the Cradle Tower were at the corners of a small triangular garden called the Queen's Privy Garden—the King's Gallery, which Oliver Cromwell afterwards pulled down, at that time dividing the King's Garden from the Queen's. The Well Tower, which still exists, is the nearest of the two to the Salt Tower, but externally no window now exists by which the Well Tower could have been seen from a cell in the Salt Tower, and the question was whether the new face of stonework had closed an ancient window, and this an internal examination alone could show. It was plain at a first glance that there was no such window. A fireplace, immediately over the broad chimney-place in the cell below, occupies the whole site of the tower that turns towards the Well Tower; while through the deep embrasure on the right hand the little modern artillery tower that covers the remains of the old Cradle Tower ^an be plainly seen. It was then in the Cradle Tower that John Arden was immured. When on the leads of his tower, he would not be so high as Father Gerard was in his cell half-way up the Salt Tower. " Here he would salute me," says Father Gerard, " and wait for my blessing on bended knees." From this loophole Arden learnt by signs that there was writing on the apparently blank pages in which the crosses and rosaries of orange peel were wrapped, and that it could be made legible by being held to the fire. " I dared not speak to him across the garden "—the two towers were about five and forty yards apart—" as what I said would easily have been overheard by others." There it was, then, in the little Cradle Tower that on the Nativity of the Blessed Virgin, now nearly three centuries ago, the mass was said, "that confessor of Christ communicated, after having been so many years deprived of that favour," and thence that Father Gerard returned to the Salt Tower, with a beating heart, bearing with him a pyx containing two and twenty particles, and thus " for many days renewed the divine banquet with ever fresh delight and consolation." Reluctantly we leave the cell where the Hidden God did not disdain to come to console the prisoner for His Name's sake, and we go out into into the paved yard which was once the Queen's Garden. The Cradle Tower attracts us, and we see that its remains are very interesting. In the lower part of it there is an arch which spanned a water-way entrance, 5 which served for the admission into the Tower precincts of arrivals by the river, whose importance did not call for the unclosing of the Traitors' Gate. This Cradle Tower was parted from its neighbour, called the Lanthorn, by a gateway through which ran the outer ward. That Lanthorn Tower, till Oliver Cromwell destroyed it, contained the King's bedchamber, and many an uneasy head has lain there the night before it was burdened with the Crown of England; but the site of that royal chamber has less interest for us at this moment than the modern little turret that covers the beautiful vaulting of the old Cradle Tower. We look over the parapet, and see before us the moat, the Tower wharf, and the River Thames beyond. Fill the moat with water, as it fills even yet in time of floods, build a wall along the wharf on the other side of the moat, and you see things much as John Gerard and John Arden saw them when they debated the feasibility of close prisoners escaping from the Tower of London. It is the one spot where their enterprise was possible. Opposite to the Well Tower on your left were buildings along the moat, as the old bird's-eye view taken in 1597 shows, which would have hindered escape there. The moat, too, is a trifle narrower opposite to the Cradle. Both the Well and the Cradle are built some nine or ten feet projecting into the moat, and the remaining width of moat opposite the Cradle is only thirty feet. There was a wall, as we have said, dividing the wharf from the moat. Over this the prisoners threw a leaden ball to which twine was attached. Their faithful friends tied the bight of a rope to it, fastening the ends to a stake, and a gun on the tower served to hold the double rope. The Cradle Tower was a very low one, probably not more than a few feet higher than the opposite wall, and the main difficulty of the escape consisted in this, that the rope was nearly horizontal and there was the greatest danger of falling into the water. The portion of the wharf that they at length reached was that which was visible from Father Gerard's cell, where Francis Page used to walk up and down, and stop and doff his hat and look for Father Gerard's blessing until at last he was noticed and Mr. Lieutenant took him in charge. To this part of the wharf a modern drawbridge now gives access between the Well and the Cradle Towers, opposite to the Salt Tower; and so, looking back upon them as we leave them and mentally reproducing the scenes of our story, we take our leave of the cruel Tower of London. 1 We find from an extract of one of Father Garnet's letters in the Stonyhurst MSS. that this gentleman's name was Arden. "Oct. 8, 1597. Upon St. Francis' day at night broke out of the Tower one Arden, and Mr. Gerard the Jesuit: there is yet no great inquiry after him." Father Grene's Collectan. P. vol. ii. f. 548. Father Bartoli also and Father More mention Arden as the name of Father Gerard's companion. In the Lieutenant's Midsummer bill to the Exchequer we have the name of John Ardente as that of one of Father Gerard's fellow prisoners. In August, 1588, "John Ardent gent." was reported by the Lieutenant as then "prisoner one year six months, condemned of treason," committed Jan. 28, 1586, and maintained at the Queen's charge, but a note is added to his name in Lord Burghley's hand, "to the King's Bench." P.R.O., Domestic, Elizabeth, vol. ccxv. n. 19. There was also a Francis Arden, who was committed to the Tower, according to Rishton, on Lady Day, 1584. A paper entitled " What course is meet to-be held in the causes of certain prisoners remaining in the Tower,", dated May 27, 1585, says of him, "Francis Arden, indicted of treason, but the matter not full enough against him, to be removed to her Majesty's Bench." Ibid. vol. clxxviii. n. 74. Later on* he was tried, condemned, and retransferred to the Tower, as we learn from the term of his imprisonment in a subsequent list of prisoners in the Tower, Oct. 24, 1589, in which he is mentioned as " prisoner two years and three quarters, condemned of treason," and in the margin "Referred to her Majesty." Ibid. vol. ccxxvii. n. 37. Francis Arden was probably a relation of Edward Arden, who was hanged Dec. 23 (Stowe says Dec. 20), 1583, "protesting his innocence of every charge, and declaring that his only crime was the profession of the Catholic religion." Rishton's Diary in the Tower. In a curious paper (Domestic, Elizabeth, vol. ccix. n. 3), dated March I, 1587/8, Robert Ardern of Burwycke gives information to the Earl of Leicester against "Mr. Ardern of Cotesford, a gentleman of Oxfordshire,''" in which paper mention is made of a man that "was Ardern's keeper that is prisoner in the Tower." Robert Arden was in the Marshalsea with Father Gerard in 1584, "sent in the 10th of Dec, 1582." Ibid. vol. clxx. n. 11. Eleven years before Father Gerard's escape with John Arden, there was a rumour current that one of the Ardens had broken prison. Sir Amias Poulet wrote from Fotheringay, where poor Queen Mary was then within a few days of her death, to Mr. Secretary Davison, Jan. 27, 1586. "There is a great alarm in the county and in counties adjoining, upon the rumour of the escape of one Arden a traitor." Poulet's Letter-books, p. 353. 2 The number of piers in old London Bridge was so large, and offered so great an obstruction to the water, that it was always a service of danger to pass under the arches while the tide was running : and often the river formed a regular cataract at this part. 3 The distance would be something over half a mile. 4 Our readers will remember that at this time each side of the bridge was lined with houses, which looked sheer down into the river. 5 Mr. Hepworth Dixon in Her Majesty's Tower gives a view in which a footbridge crosses the moat from the Cradle Tower and a pathway leads to the river-bank. This is evidently owing to a misunderstanding of the water-gate which is shown in the contemporary engraving.